OTTAWA, Jan. 18, 2017 – The world’s centre of gravity has shifted to the Pacific. It’s time for Canada’s military and security policy to shift along with it. Edward Luttwak, in a new commentary for the Macdonald-Laurier Institute, argues Canada should add its considerable middle power weight to buttressing the defence against threats from China and North Korea. “Nobody can reasonably suggest that Canada should restructure its armed forces on a very large scale in order to become a major power in Northeast Asia”, says Luttwak, an associate at the Center For Strategic And International Studies. “But given that Canadian political and economic leaders know very well that the centre of gravity in world politics has changed, it would behoove Canada to gradually acquire a significant stabilizing role”. 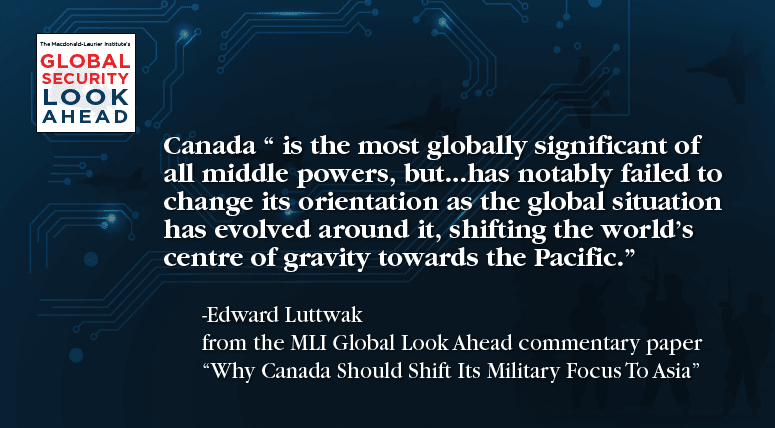 The commentary is the first entry in MLI’s “Global Security Look Ahead”, a six-part series of commentaries exposing the major security issues Canada is facing around the globe. To read the full commentary, titled "Why Canada Should Shift Its Military Focus To Asia", click here. Edward Luttwak is an associate at the Center For Strategic And International Studies.